Horchata de arroz is a deliciously refreshing Mexican beverage made from rice milk, sugar and cinnamon and served chilled over ice. Wonderful for those who are lactose intolerant if you substitute the milk for almond milk. Similar to my Avena recipe, which is made with cooked oatmeal instead, this is a great raw alternative and naturally gluten-free. It’s usually made with white rice but I experimented with brown rice and raw sugar and the results were lovely. Sweeten to your taste or even experiment with stevia for those of you on a restricted sugar diet. Soak the rice overnight or at least 8 hours in water with cinnamon sticks. The next day discard cinnamon sticks and blend the rice and water in your blender at the highest speed for about 5 minutes. Pass through a fine mesh sieve about two times to catch all the gritty bits. (A stocking works great) Discard the remaining rice pulp. Pour into a pitcher, add skim milk, sugar, cinnamon and vanilla and mix well by stirring. Refrigerate until ready to serve. 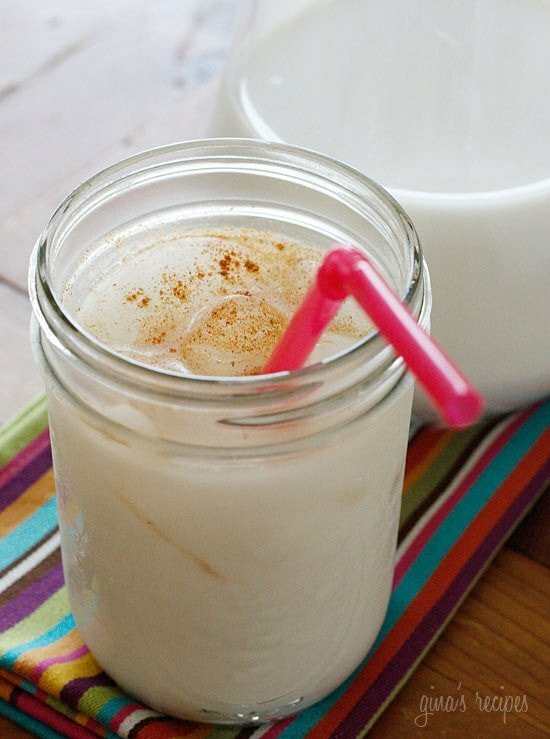 To serve fill a glass with ice, pour horchata into a glass and sprinkle a little cinnamon on each serving just before drinking. *This was tricky to calculate, I discarded about 1/2 cup rice pulp so I deducted this from nutritional info. The next day do you need to rinse the brown rice after removing cinnamon stick before blending? Yes! Remove the cinnamon stick for sure. 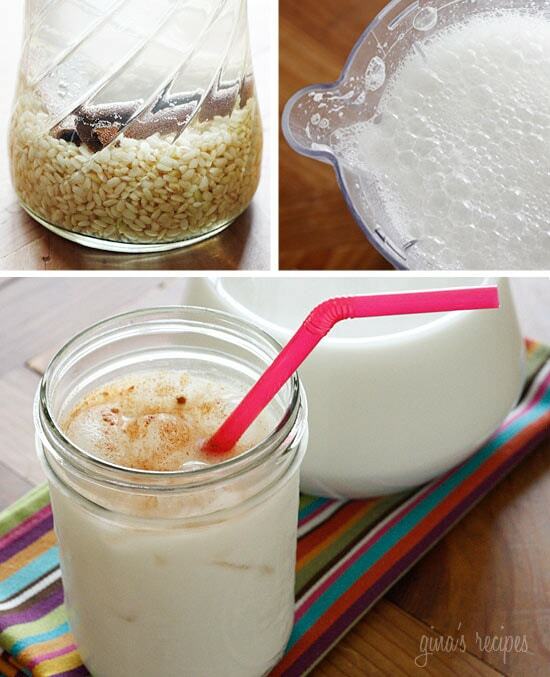 Instead of throwing out the rice pulp, use it to make rice pudding. We tried it once, and it was unbelievable. Plus, no waste! My family is having a Mexican themed Mother's Day celebration so this is the perfect treat to bring to spoil my grandmother, aunts and of course my mom. I LOVE your recipes Gina. I am getting married in May of next year and I have been furiously writing down all your recipes for when me and my fiance move in together. Thank you for being a life savor! Thank you for all your recipes. 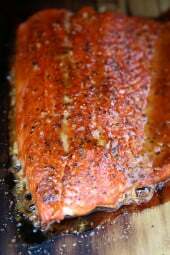 I loose weight with them and cook a lot healthier. You're recipes brought me on the right track. So, I am guessing that this could be counted as a serving of dairy on the WW site!? I'm Mexican and this is my absolute favorite drink. This was the best freakin' horchata I've ever had! 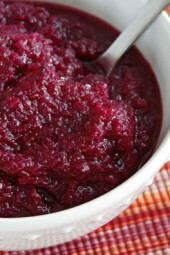 Just found this recipe! It's 11pm and it motivated me to get off the couch, find my rice and cinnamon, and give it a soak. I can not wait until tomorrow morning to try it! Your blog is amazing! I may have just fallen in love a little bit. Yep, it's love. Thanks for this recipe! I'm hoping to try this on my pregnant mother soon. She is very particular with her sweets and I'm hoping she'll like this skinny version. Thank you for helping me master my trickery of healthy drinks and meals~ No one will ever suspect it! Just soaked my rice (white) last night with cinnamon sticks. Blended in my Vitmaix this morning. Do you get a lot of leftover pulp, cuz when i poured into a fine strainer i didn't see anything left!? So I poured the pureed rice water in a jar along with vanilla and cinnamon. Was off to work but had to try some so I poured a little milk in a glass with a little stevia to sweeten, added ice cubes and poured the horchata mix in the small glass. Gone in seconds! And guess what? When I got home I did the same thing except it was a LARGE glass this time! Fun and simple. Thanks!! KatyLady- Pier one last year! Where can I find that striped towel? Connie, I see we have similar taste in food! I just finished planning a week's worth of meals only using your recipes! So far, so AMAZING. Your aji verde sauce (from your peruvian chicken recipe) is ON POINT. i love your site and will be using it often! oh and brown rice orchata? GENIUS. thanks! 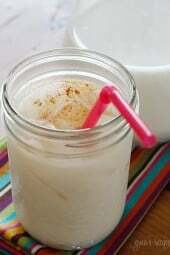 I love Horchata, and have always wanted to try and make it at home…this will have to be a "must try"! You should also try unsweetened almond milk, with a dash of nutmeg and cinnamon, a few ice cubes and some sugar or splenda in a blender. For me, the almond milk really does the trick. This looks awesome! I've never heard of it before. I love your pictures too! if i was to use stevia instead of sugar/agave, how much should i use? One of my faovrite things, Love it. I've never had horchata before – is it usually made with white rice? (I'm guessing based on the comments). I just printed it out so I can give it a try! Yum. I adore horchata so I LOVE that you have a figure friendly version. I usually make mine with vanilla soy milk and almonds (per a Rick Bayless recipe I love) for a fuller flavor, but they both definitely add the calories. I'm curious to see how this compares and also how using brown rice would stack up against using white. I have a cinqo de mayo themed party coming up so I may have to try this and compare. I love horchata, and love how this is made with brown rice. I can't wait to try making this this weekend! Just in time for Cinco de Mayo. Thanks. What is my name- I personally don't like the taste of Stevia, so it really depends on your taste. I prefer the flavor of sugar so I just use less. Yasmeen, yes soaking it overnight plumps up the rice and makes it soft. So much easier to grind. Amber- Yes, this is soaked overnight in the refrigerator, raw. No cooking required. This lasts in my refrigerator about 3 days. My kids love it. How long can you keep this in the refrig after you make it? Oh gosh that looks delish AND refreshing! oh, i love horchata! i just posted about it a few weeks back. i was missing it hugely since moving out of the US. 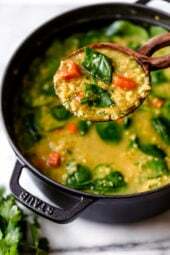 i love your version with brown rice and will try that next time! also, i ground up all the rice dry, then added the "rice meal" to the milk + water + cinnamon sticks to soak overnight. perhaps doing it your way and soaking the rice overnight would make it easier to grind in the food processor? By "soaking" you just put the rice in water? You don't cook it? Thanks! Love your recipes, can't wait to make horchata! We've bought the powder mix kind, and it's not so great 🙂 Thanks again! Do you think stevia would be comparable? I love horchata so I really don't want to sacrifice the taste. I had no idea horchata was so simple! Can't wait to give it a try! I was just wondering how to make this the other day. Now I have a healthy way to do it. Thanks for leaving a comment Cynthia! My daughter likes it sweeter than I do, so she just adds a little bit more sugar but it's so good! Jenny, it's very simple as long as you don't mind the overnight soaking! Brilliant! I'll definitely have to try this. Gina, I LOVE horchata and honestly I haven't had very much of it at all since I started this new lifestyle! I CAN'T wait to try it!!! Brown rice, GENIUS!